Here’s a concept that trips up many people: Forgiveness. Oh, sure, you know you should forgive. But you just don’t know if that is the best idea. Maybe you believe you just can’t forget what happened (myth: “forgive and forget”). Or maybe you don’t think that person deserves to be “let off the hook” (also a myth). Or perhaps you don’t want to have anything to do with that person (forgiving and connecting are 2 different things). In this week’s podcast, I discuss the myths of forgiveness — and how important it is to practice forgiving. And if you need a process to follow on how to forgive, check out this earlier podcast or you can check out this one. Forgiveness is such a loaded term in our culture. 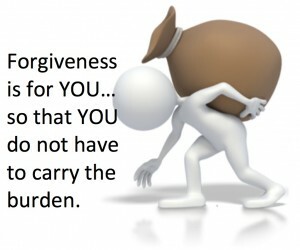 You are told by some to forgive, as if it is a burden that must be done. Others tell you not to forgive, but to hold on to the hurt — so the other person is held responsible, I suppose. Forgiveness, to me, is an opportunity. Not an obligation or burden. But an opportunity to step into a new future without the binding of old pains. The cultural baggage around forgiveness has created some “myths” about forgiveness. We misunderstand what forgiving is about, what it means, and how to do it. 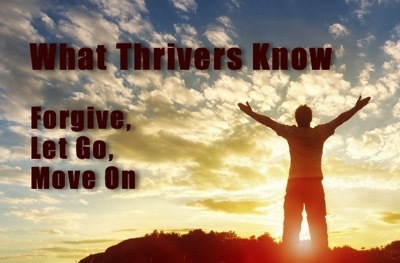 Over the years, though, I have realized that people who thrive in life have mastered the skills of forgiving. They do not see it as obligation, but simple opportunity. 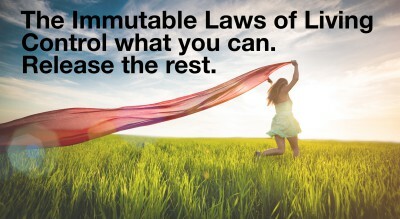 It does cause us to look closely at ourselves and re-take control (and responsibility) for life. That is a thriving opportunity. Listen in to discover what forgiving is really about — and how to do it (6 simple steps). Many of us agree: forgiveness is a good thing. Then why do we find it so hard to forgive? I believe it is because the reasons to forgive (or not forgive) tend to flip in our minds, even when we know better. There are two very clear and different paradigms for what forgiveness is, and even what is forgivable. One paradigm keeps us stuck. The other frees us. Which paradigm do YOU carry around? And if you choose to forgive, how do you do it? In this week’s podcast, I tackle forgiveness and offer a structure on how to forgive. I also take on some “myths” of forgiveness. We have established that fear is a given. We cannot get rid of it. We can only decide whether or not fear will run our lives. And we can decide how we will respond. But what if you find yourself constantly in the grips of fear? There are two basic approachs to life that are steeped in fear: Controlling and Passive. These approaches, on the surface, appear to be opposite. But in reality, just below the surface, they are identical. They are steeped in founded in fear. In fact, there is a core terror involved in both approaches.The Passive person chooses to let life make the decisions for him or her. Wherever the waves toss, there is where the person lands. Being active feels either futile or terrifying. For some, the terror is based on feeling as if others will be watching and judging. And perhaps even more frightening, life might just hold that person accountable. Passivity comes in many flavors. For some, it is just a matter of inaction –staying in the same job and miserable year after year, staying in a miserable marriage but doing nothing to make it better, or a myriad of other things. We stay and do nothing. Then there is the inactivity of avoidance. This is when we pretend not to notice, put those blinders on, and keep moving. Miserable job? It hasn’t even registered. Relationship falling apart? What relationship? Some master passivity as a way of expressing anger. Instead of expressing our anger, we use passive behavior to sabotage the other. Someone asks us to do something. We agree to do it, then don’t. They confront us, and respond with “I forgot.” Abdication of responsibility on a silver platter!Some maintain passivity as a philosophy better known as futility. It is much easier to pretend that nothing matters, that actions account for nothing. In believing this, we are relieved of any responsibility. At least we pretend this to be the case. When I was a boy, my father returned from a trip with a gift, a small piece of granite with these words painted on it: “Not to decide is to decide.” To a small boy of eight or so, those words don’t mean a lot. But they have become more and more pronounced as I have grown older. In actuality, there is no such thing as passivity. Every moment of every day, we are making decision after decision. Often, we make those decisions by not deciding. We pretend we have relieved ourselves responsibility by not deciding. Yet a decision has still been made. The Controlling person is just as fear-based as the passive person. But the control is based in the clear illusion that anyone has any level of control over life. Okay, that might sound paradoxical or even contradictory to what I just said about being passive. I moved the conversation to the importance of being active. Yet now I state that there is no control. Here is the key: people who act in controlling ways fool themselves into pretending they have some ultimate control over their life. People who are pro-active in their lives assume that nothing is guaranteed and everything is at risk. But moment-to-moment, pro-active people move in ways that allow them to meet life, to approach life with hope, an antidote to fear. OK, this one can be controversial, so hear me out. A memory is merely a thought. It is a thought about something that happened in the past, which we then pull into the present. Some of those thoughts are helpful, but others are not. I am NOT saying that you should ignore painful events from the past and pretend they did not happen. That is denial. I AM saying that we all can acknowledge that our memories are not entirely accurate. That is what I mean in this rule. Thoughts are always our perceptions and interpretations of reality. And memories are those perceptions and interpretations brought into the present. We never have an accurate portrayal of an event. If you understand what I mean in the last paragraph, you may find my first sentence to be a rather strong assertion. Again, I am not saying that these events did not happen, that there is not truth in the events. It is just that we tend to believe that we: 1) accurately remember those events (we do not), and 2) we cannot let those events go (we can). So, let’s take those in order. First, we do not remember events as they happened, but how we interpreted them. We missed some facts, created other facts, and misinterpreted many facts. That is just the nature of our memories. It is neither good nor bad, just how our minds and our brains encode information. More than that, plenty of research shows that memories are actually quite malleable. In other words, memories themselves change over time. We interpret memories based on what is going on now. In other words, we may find ourselves using memories to fit what we want to believe, not with what happened. A friend of mine in graduate school, in his dissertation, said this: “we create the past and remember the future.” I love that! It gets to the essence of what I am saying. We would so love to be creating the future and remembering the past, but that is not the case. 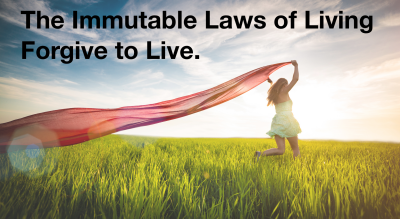 We live out our future course partially based on what we believe has happened to us. And our memories are created in ways that facilitate our current beliefs. Which leads to the second point: we hold onto those events. This is where the real power of this rule comes in. If we let go of the illusion that we remember events with historical accuracy, then we can accept that we cannot define ourselves merely based on events in our past. When we act assured of our accuracy of memory, we get to pretend we are the victim or victor in a particular situation. Not very helpful. When we can acknowledge that a memory is flawed, we are less tempted to keep pulling it out as proof of who we say we are. How often do you define yourself by your memories? How often do you pull out your memories of events as a way to remind yourself of what you believe about both yourself and the world? This is an invitation to hold those memories a little more lightly.